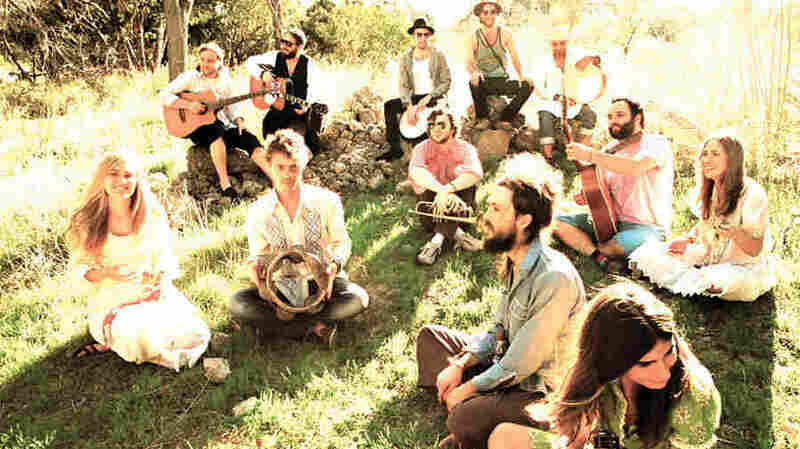 Edward Sharpe And The Magnetic Zeros Are 'Here' David Greene profiles the 12-member indie-folk band, which just released its second album, Here. It's the first of two albums the group will release this year. "There is no character, you know?" Edward Sharpe and the Magnetic Zeros' Alex Ebert says. "I'm trying to be the most open and powered-by-the-universe version of myself than I can summon." The L.A. indie-folk band Edward Sharpe and the Magnetic Zeros has been described as looking like something of a hippie cult on stage. Of course, every cult should have a leader, and this one is led by a singer whose real name is Alex Ebert. He has a long beard and long, unkempt hair, and he often doesn't wear a shirt or even shoes. During shows, he dances around in circles shaking a tambourine. It could seem like an act, but when he recently talked to NPR's David Greene, Ebert didn't look or act like a different person. "There is no character, you know?" Sharpe says. "I'm trying to be the most open and powered-by-the-universe version of myself than I can summon." The 12-member band has just released its second album, Here. It's the first of two albums the group will release this year.